The Arctic has been much on our minds of late. Today we mark the centenary of an epic moment in polar travel. One hundred years ago today, the Karluk was wrecked in the Chukchi Sea. The ship set off from Vancouver Island in June 1913 on a voyage to explore and map the Canadian Arctic. The Arctic has been much on our minds of late. Today we mark the centenary of an epic moment in polar travel. You'll recall our first e-brief of 2014 when we commented on the rescue of the crew and passengers of the Chelyuskin. We won't make too much of a habit of reporting from beyond the boundaries of Europe. But let's stay in the cold seas off the north-east coast of Russia to recall another celebrated moment of Arctic travel history. One hundred years ago today, the Karluk was wrecked in the Chukchi Sea. Yes, that's the same sea that we featured last week in the story of the Chelyuskin. Most of us have only the haziest mental map of the High Arctic. So let's place the Chukchi Sea. It lies just north of the Bering Strait, stretching from the East Siberian Sea as far as Point Barrow in Alaska. Wrangel Island (which belongs to Russia) marks the westernmost limit of the Chukchi Sea. 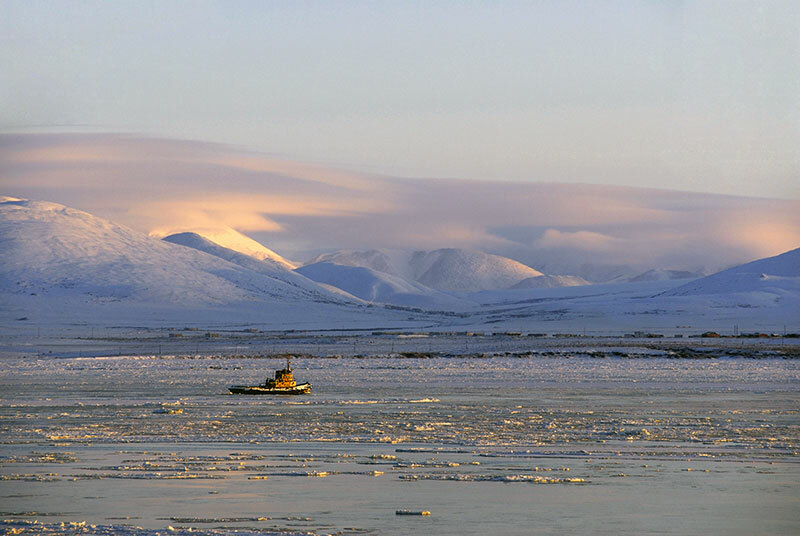 For mariners following the Northern Sea Route across the Russian Arctic (often dubbed the Northeast Passage), the Chukchi Sea is the last great obstacle before turning south to pass through the Bering Strait to the Pacific Ocean. But for the whalers of yesteryear, the Chukchi Sea was more than merely an obstacle. It was a good hunting ground for whalers in search of bowhead whales, must prized for their baleen - often referred to as whalebone though not a bone at all, but really a keratin-like product, much like human nail tissue. European ladies of another era were kept in shape by whalebone corsets where the stays were made of baleen. And the parasols that protected those ladies from summer sun had ribs fashioned from baleen. But the Karluk expedition was not a voyage in search of baleen. The ship set off from Vancouver Island in June 1913 on a voyage to explore and map the Canadian Arctic. The expedition leader was Vilhjalmur Stefansson - a Canadian of Icelandic extraction. His family had settled in Gimli in Manitoba, along with many other migrants from Iceland, in the mid-1870s. The ship's captain was Bob Bartlett, an accomplished mariner from Newfoundland who had taken part in Robert Peary's polar expeditions. The Karluk made fast progress, stopping off in Nome in Alaska in mid-July and continuing north through the Bering Strait. Captain Bartlett then struck a coast north-east along the coast of Alaska, clearing Point Barrow and entering the Beaufort Sea in early August. But shortly thereafter, the Karluk was caught in pack ice. Expedition leader Vilhjalmur Stefansson left the ship, along with five other members of the expedition, and eventually made it to safety on the Canadian mainland. There is still much debate in the polar research community as to whether Stefansson was guilty of abandoning two dozen men and women who had placed their trust in him. Some commentators suggest however that Stefansson was merely leaving the ship on a short hunting expedition and that the Karluk had drifted west by the time he returned. Meanwhile, back on the Karluk, Captain Bartlett was now very much in charge. The Karluk remained ice-bound, moving with the westward drift of the ice back to the Chukchi Sea. By late 1913, the Karluk was well into Russian waters, and still the inexorable westward drift continued. On 10 January 1914, the pressure of heavy ice fractured the hull of the Karluk. Captain Bartlett recalled the moment in his memoir: "At five o'clock on the morning of the tenth, I was awakened by a loud report like a rifle shot. Then there came a tremor all through the ship." Later in the day, Bartlett gave the order "All hands abandon ship." Bob Bartlett surely gave thanks that he had spent a good part of the preceding months teaching his crew a range of polar survival skills. All on the Karluk abandoned ship, Captain Bartlett being the last to leave - he had the foresight to rescue the ship's phonograph, so the castaways could bid adieu to the Karluk to the sound of Chopin's Funeral March. Half of the two dozen people on the Karluk survived. The last members of the crew were not rescued until September 1914 - almost eight months after the sinking of the Karluk. They had survived by camping on Wrangel Island. Among the castaways was an Inuit family. Their two young girls, Helen and Mugpi, brought a dash of normality and comfort to the extraordinarily difficult living conditions. The ship's cat, Nigeraurak, also survived the ordeal. Others among the team were not so fortunate. But that anyone came out alive from the Karluk disaster was a tribute to the leadership of Robert Bartlett. The Royal Geographical Society subsequently awarded Captain Bartlett a medal for his outstanding bravery. Bartlett's memoir The Last Voyage of the Karluk (published in 1916) is a classic account of struggle and survival in the Arctic.